December is finally here and that means today is the first day of our 12 Days of Christmas promotion! Please start commenting and you'll be entered into our random drawing to win a great little prize from a local artist or crafter. We have things to give away from cards to candles to prints, soaps, jewelry and more! 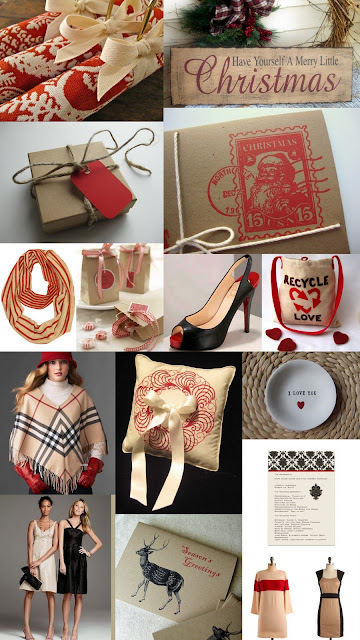 Now, in the meantime, to get us into the holiday spirit here is a color board that says Christmas with style. One look at this color board will leave you longing for a snow day where you snuggle up with a warm blanket and sip cocoa by the fireplace. Red is a signature shade of the holidays and it very vibrant, but here it is toned down with the neutral khaki, black, and white to create a rustic, country look with a level of sophistication that we think even the people over at Burberry would be pleased with. I love this color board, Burberry is the first thing that came to mind. A very sophisticated Christmas!! Where is the recycling bag from? I love it! I really like the khaki colored dress! I love the idea of a having a holiday give away! Please let me know about if you are interested in including the jewelry I make in future give aways! Already done all my christmas shopping and Erich said I am not allowed to decorate anymore :( But I love the festive ideas! Love the red/khaki combination, especially the recycle love bag!